Mental illness and suicide are not topics I usually associate with Young Adult Fiction. Whenever I pick up a copy of my favorite genre, I expect to lose myself, relax and just delve into a world that is not my own, where there are a few tears, but none so devastating that it would affect me deeply. 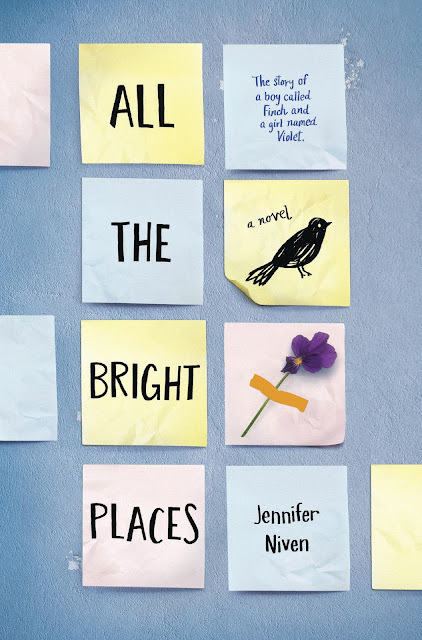 Reading the blurb of Jennifer Niven’s book All The Bright Things, I already knew I had to prepare myself for something I possibly wouldn’t enjoy in the shallow way I often want to with YA books. And so I only started reading it the day before my scheduled interview with the author. Maybe I was afraid, or maybe I was trying to save myself from being devastated. I will not lie. All the bright Things is a heavy book. It does leave the reader emotionally shaken and heartbroken. But it also made me rethink my ideas on what mental illness can actually do to a person, slowly but inevitably, if left on their own. What is most interesting with the book is that it was written in a two person point of view and both these persons were suicidal. One was Violet who suffered from guilt and depression. The other was Finch who had an undiagnosed bipolar disorder. 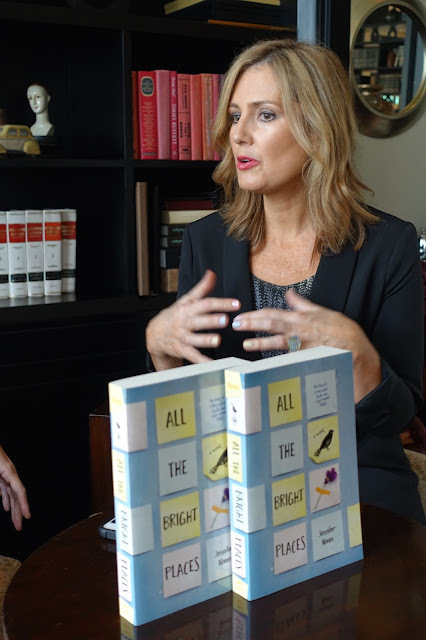 Jennifer Niven was brave in articulating the thoughts and feelings of Finch because she herself had one. A person she loved committed suicide not so long ago and this book she says, is in a way, her catharsis from that episode in her life. Lyn: Jennifer, this is the first YA book you ever wrote and usually YA books are light and romantic with conflicts that are in the end resolved. Yours was dark and very serious. Why did you choose that? Jennifer: It was inspired by a real story and a real boy I knew. I just wrote about the boy I knew. There are many things that are different with Finch and Violet but at the core it’s the story that I lived. Also dealing with mental health stories, I feel that there are so many issue books that kinda romanticize suicide or mental health issues and I didn’t wanna do that. I wanted to just write it honestly and as truly as I could write it. L: What do you think is a big problem with Mental illness. Is it the stigma? The lack of support from families? Or the silence? J: I think it’s all of that. When I lost the boy I loved in real life, I almost felt like I couldn’t talk about him or mourn him because of the way he died and it was a really horrible way to feel. I remember thinking, if I felt this way, imagine how he felt and other people feel who are suffering from mental health issues and they feel like they can't speak out or say I need help because of the judgement or the silence or the lack of interest or support. J: I think they just kinda came into it knowing him as they knew him like this is Finch, he is weird and he changes his clothes like he changes his personas. So I think they didn’t have all the information. And also Finch was very guarded about what he shared and that was part of it too. He would only let people in so far. Violet got the closest but even she, he didn’t want to put all that he was dealing with on her so he was very protective of her. I think Finch’s parents could have paid more attention and been more involved so I think they have to shoulder a lot of it. But Finch also needed to speak up and say I need help. 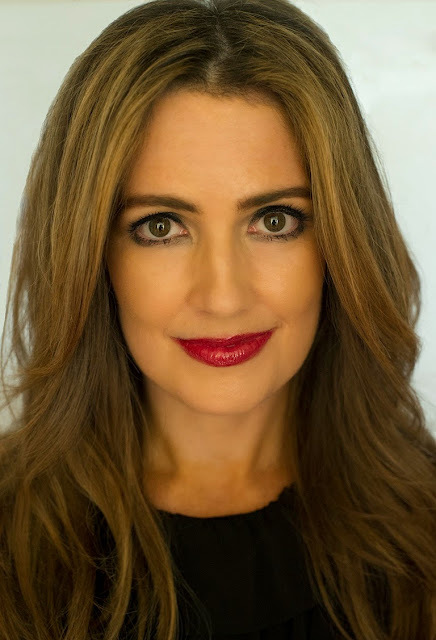 And part of writing the book is to start these discussions of us needing to talk more about this and that we need to know that it is necessary to speak up if we need help and we need to be receptive as people being spoken to. L: How did you get into the head of Finch? Or did you base Finch on the person you loved? J: That really formed him most of all and knowing him so well and seeing him up close and personal, everything he struggled with every single day. And also the magic he created by just being him. All of that formed Finch the most. I also talked to experts and talked to people I know who are struggling with depression or have struggled with suicidal thoughts as well just to verify everything that I am putting into this character as I knew from this boy. L: Why didn’t Finch ask for help when he pretty much knew he was suffering through something? J: Putting him in a box and the thing is that when I think about Finch, I think about this wonderful person he became as I was writing him. L: Could it have been genetic then? Or a result of bring abused by his dad? Or just having a dysfunctional family with a mother who has checked out? J: Bipolar disorder does tend to run in families so chances are he inherited it genetically from his dad, so triggers can come from stressful situations like his father’s abuse. As you see in the book every time Finch has an episode or he is considering suicide, it comes from some sort of a run in with his dad or with Roamer (a school bully and Finch’s former friend). His mother is just checked out and shut down in her own way that she can't see what's happening with her kids. But she feels like a better mother than she is. J: The sad part is that there are so many stories like that. Unfortunately there are parents like that. Some adults who have read the book say they take issue with it because they think that’s not realistic because the authority figures are not doing anything but in my high school, the counselors were not in tune with what kids were dealing with and we lost kids to suicide because counselors were not paying attention. It's not the only reason but it was certainly a part of it. And I hear from teens every single day say “my parents just say get over it, you’re just being emotional, you’re just a teenager” or they don’t wanna hear it at all because they're too busy and I just think why is that happening? L: You have said and you’ve written that you had your Finch but for a long time you didn’t want to talk about it. Why did it take so long for you to open up about him? Do people ask you about him now? J: They do. And now it's so much easier to talk about it because I wrote this book and writing it was really difficult because I hadn’t talked about it that much except to one or two people. So it was very scary because I didn’t even know if I could put all that out there when I haven't dealt with it myself fully. The reason it took so long is because it was such a painful experience in so many ways. But this let me go back to all the loveliness too because there was so much lovely stuff about the relationship and about him. And I'm so glad that finally I was able to get in there and get this out. L: How old were you when THAT happened? J: I was not in high school, I was actually in my 20s. we were both in our 20s when I knew him and one reason I wrote it as YA is, one, I just love reading young adult ,and two, I thought I needed a little bit of distance in terms of reality in order to write this because otherwise it's gonna be too much and I'm gonna freeze on the page. So by giving it to these two characters in high school it just immediately broke that, it made me feel like okay these are two different people, but I can give them all the feelings that I had and that he had. L: How much of Violet is actually you? J: You know I say..
L: You called yourself a Survivor of Suicide. What was it like for you moving from that point? J: I did a lot of denial I think. I would try to write some of it out but it was….i was not ready to face certain things. I knew him in Los Angeles and I lived there for a long time and not long after he died, I had to move back to the East Coast where I grew up because I just had to get away from it and I ended up coming back a few years ago to LA. And it's only since I've written the book for instance that I've been able to drive by the street where I found him. L: So it’s now just a part of your past. You have cleansed yourself of it? L: What reactions have you gotten from readers? Has someone reached out with their personal experience? J: Absolutely. It has been overwhelming. I have heard from thousands of readers across the world saying… the main message I hear is thank you so much for writing this book. You have made me know that I am not alone and that I am gonna get help, I am going to tell someone how I feel, I don’t wanna end up like Finch, I want to find the bright places in my life, I want to wander, I want to make the world lovely and that is just the best feeling hearing that. I heard from one girl who actually went to her local Target and she was buying sleeping pills. She’s 17 years old, she was gonna end it that day. And my book for some reason was shelved by the sleeping pills so she picked the book up because it was so strange that it was there. She opened it and saw the first line Is today a good day to die? And she just thought I need to read this. So she took it home, read it, forgot about the sleeping pills and the next day she told her parents and she is in counseling now. It's that kind of thing that I am hearing and it is powerful. L: What got me most is the song that your loved one left you. “And in two weeks we’ll fly again. Perhaps a Chinese dinner then. You make me happy, you make me smile”. Is there ever a day that you don’t sing it in your head? J: I don’t think so. Especially since I’m now back in LA which is where it happened and also we would wander LA. So many places in LA just because, and so I think about that when I'm driving around. It's a good feeling now. And now I can think about that song, which I do almost daily, and it's a good thing and it makes me smile too. L: Does it make you sing it? J: It does make me sing it. The sad thing is he sang it to me one time and so I have the melody but it's such a fragment of the melody and it's so fragile, I try to keep it. So I think about it all the time because I don’t ever wanna let go of that melody. L: Do you ever go back to where you wandered with him? J: Yeah…at first it was difficult, but now it has become a bright place. L: what would you want your readers to take away from ALL THE BRIGHT PLACES? J: I want them to take away the fact that they aren’t alone and that they are very important and necessary. I would say you’re the only you in this world. And that even in the darkest times, there are bright places around us and that WE could be bright places also. Registration starts at 10am for both events. Only books purchased from The National Book Store, National Book Store Express and Powerbooks will be accommodated. A special thanks to Mr. JB Roperos of the National Book Store for arranging my interview with the author.